Aikatsu! – 155 | Mezashite! We weren’t convinced on what to put the audition name as, Heartthrob Karat or Tokimeki Karat. On the one hand, there’s an okay translation. On the other, it actually shows the name in romaji as Tokimekikarat. Just imagine the one you prefer. 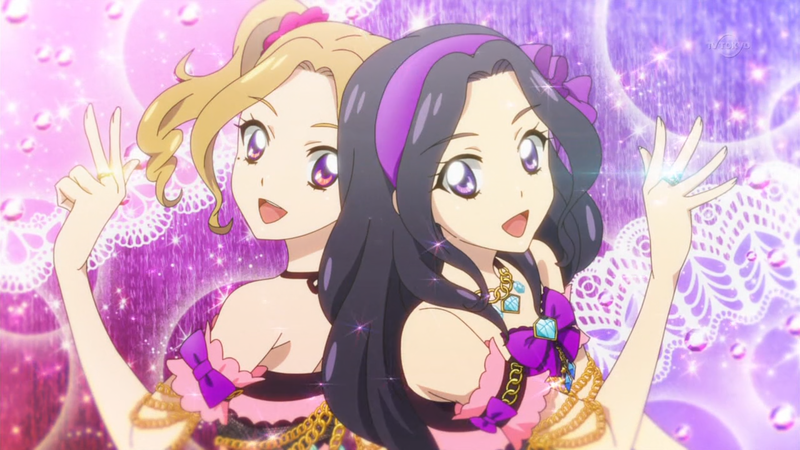 This episode also had the very first insert song and concert scene in all of Aikatsu that I can remember. It’s always just been one or the other whenever there’s a drama episode. Tell me if I’m wrong. Thank you for your efforts, as always. two songs in each episode. Thanks again for the sub! So who’s going to get taken off caffeine first, Kii over at Dream Academy, or Nonocchi? Episode 30 had an insert song playing as Sakura met Green Grass, then a concert at the end. That is true. I might have to change the statement to “original not-concert song being played for the first time” then. I guess also to split hairs even further, Yakusoku Carot is a “CM” song not a “drama” lol.